Award-winning garden designer and landscape architect Douglas Coltart of Viridarium was chosen to design the New Lanark roof garden. From the first moment he saw the roof-space, which extends to around 9,000 square feet (900 square metres), Douglas recognised that this commission presented a unique challenge and a wonderful opportunity. He began by sketching out rough proposals and ideas about how the garden could be developed, and these were gradually refined in discussion with New Lanark Trust. The final design selected can best be appreciated from the viewing platform. Its pattern of gentle curves and swirls, reflects the turning arc of the great water-wheels which once powered the cotton-mills and the flowing lines of the threads moving through the historic machinery as the yarn was spun, twisted, wound and woven. Integrated into the design are seating areas - deck circles - where visitors can lounge and admire the views, contemplate the attractive tapestry of plants and shrubs, enjoying the sight of the light reflecting on the water, the sounds of insects, birds and perhaps children’s voices, breathing in the fragrance of the plants which perfumes the air. They may also ponder on the quotations from Robert Owen’s writings which are incorporated into the design. The majority of the roof surface has been created using resin bound gravels in various colours whose lines lead the eye through the garden, but there are also two grassed areas. The sandstone paving was chosen to complement the colour-tones and textures of New Lanark’s beautiful historic buildings, which were built from local sandstone, quarried nearby in the Clyde gorge. The water feature creates a central focus for the garden and it provides a calming reference to the natural energy of the river which rushes past below, the life-force of the entire mill complex. but also the most innocent pleasures which man can enjoy”. The sculptures have been created by a number of different artists, using in a variety of materials – bronze, wood, and recycled metal. One of the patterns laid out in the garden is a maze or labyrinth. This is a feature with Utopian associations, representing a symbolic pilgrimage or quest for enlightenment or harmony. 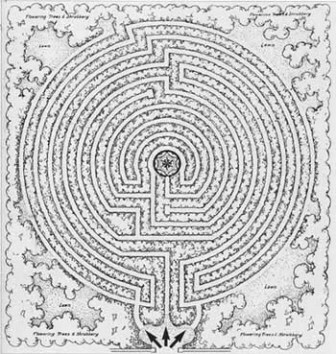 There is a labyrinth in New Harmony, Indiana, USA which is the settlement Robert Owen purchased when he left New Lanark in 1825, with the aim of establishing a truly Ideal Community in the New World. The original maze, planted at New Lanark in 1814, fell into disrepair in the mid-nineteenth century. This plan is of the existing New Harmony Maze planted in 1939 to commemorate the original vine hedge maze. New Harmony is still a popular heritage site, with a fascinating history, as well as a resident community.